Having been at the Sutton v Forest Town reverse fixture in October, we felt we just had to be at this match, and with just three points seperating the teams this certainly had the makings of a good game. This wasn't our first visit to Forest Town, but it was our first sight of the new, recently erected floodlight pylons. Impressive they cetainly are - blimey are they tall !! These will be, apparently, among the best lights in the County when they are up and running - for this game though we had to endure the low level eye-boggling temporary ones -- not ideal but adequate I suppose. Headed straight for the tea-bar ... rewarded with a smashing cup of coffee that certainly was as good as you can hope to get -- styrofoam cups have replaced the proper mugs we had last visit -- but at £0.50 this was well worth an 8/10. Regular Forest Town keeper and skipper, Jason Johnson, was not present, so Steve Boot was between the sticks -- Sutton welcomed back striker Peter Stubley, with Ben Greenhalgh having to settle for a bench spot even though he netted twice last time out. The first incident of the game involved Stubley and Boot -- the no. 10 sliding in on the keeper - not a nice challenge, but Boot did no more than get up and push Stubley over - this altercation ended with them both in the Refs notebook... Boot could have easily seen red for the retaliation. It was the home team who opened the scoring after 15 minutes. A 40 yard cross-field pass from Jamie Batty found Mark Robinson who also hit a 40 yard pass - this went straight to MARK CARTER who delicately lobbed Snipes keeper Frost from the corner of the box. Not a lot Frost could do, the ball was so well placed. Stubley almost made amends just three minutes into the second period - a neat header from Newman's cross saved well by Boot. The Snipes did take the lead in the 65th minute though - a great through ball from substitute Richard Guest put PETER STUBLEY through and he calmly rounded the keeper before slotting home. 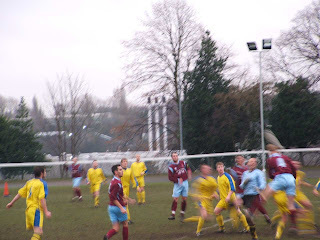 It was to prove Stubley's last contribution to the game - he was hacked down by Ryan Gregory as he scored, and suffered an injury that meant he couldn't carry on. It appears that the officials both missed the challenge so no punishment was handed out to Gregory - again this could easily have been a red card. As we climbed the steps to exit the ground, the following comment was overheard "they f***ing cheated us!" -- bloke to bloke this wouldn't raise an eyebrow, but this was a young woman talking to a girl who must have been something around 6 or 7 years old !! Now I've been known to utter a curse or two, but I really was gob-smacked - Peter Stubley's dad was also a little shocked " did she really just say that?" he said ....yes, Mr. Stubley, she did.